Ho-hum might be putting it nicely. The lack of weight in this bat as well as the single piece design made it an absolute hand killer. We don’t know of a single person that thought it was great. If you see slow pitch speed and need as much bat speed as possible then its a maybe. If the price… Jump to the full review. We aren’t the only ones to have information about the Hyperlite Drop 11. Other places, in particular those who sell bats, usually have a boiler plate write up on the specs of a bat. Many of those we reference to make sure we are seeing what we should be. Here are some more references for the 2018 Easton Hyperlite Drop 11 review. Ho-hum might be putting it nicely. The lack of weight in this bat as well as the single piece design made it an absolute hand killer. We don’t know of a single person that thought it was great. If you see slow pitch speed and need as much bat speed as possible then its a maybe. If the price is right go for it. Otherwise, if you need a light swing, look elsewhere. Our hitters liked the ultra light swing and massive barrel that out sized any other drop 11 bat in the USABat space. But the like ended there. The bat lacked enough gumption, and had some issues with hand sting, that it received the worst ratings we could find on any 2018 USA Bat. It was meant for the light swing but was dwarfed by bats like the 618 Solo. Unless the price is unbelievable its likely you should look elsewhere. At the time of this writing there are three drop 11 USABats on the market: the Rawlings VELO and Rawlings 5150 as well as the Slugger 618 Solo. With all respect to Rawlings, we don’t think either the VELO or 5150 hold a candle to the Easton Ghost X Hyperlite. The 618, however, felt great for us. But, it lacked the barrel size and oar like feel that many of our younger players tended to prefer. The 5150, VELO and 618 Solo are single piece aluminum bats at a fraction of a price point when compared to the Hyperlite. If the price point of the Ghost X Hyperlite wasn’t in our wheelhouse, or we disliked it for any other reason, we’d go with the 618 Solo in a drop 11 for the light swing. As much as we love the Easton USABats, we are struggling to find room in our hearts for the naming decisions. Do not confuse the Ghost X Hyperlite with the Beast X Hyperlite. The Beast X Hyperlite is either a drop 10 or drop 12 single piece ALUMINUM bat also built for the USABat space. If you are anything like us, after searching a number of outlets, all those bat names start to look the same. But, no, they are quite different. We’d venture a guess more than a few folks are going to pull the trigger on the Beast X Hyperlite thinking they just saved a few bucks for the same Ghost X Hyperlite. But, oh no. The Ghost X Hyperlite is a single piece composite bat. It is the only single piece composite bat in all of the USABat space for 2018. In many regards, it serves the market where Combat (now defunct) may have delivered. 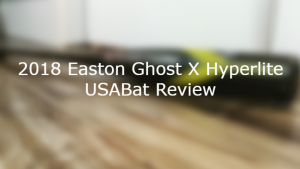 Those familiar with Dirty South Bats will be quick to claim the Hyperlite is not the only USABat in a single piece composite. Fair enough. But at the time of this writing we have yet to see that bat in production although it is widely talked about. The composite in the Ghost X Hyperlite is referred to by Easton as EXACT Carbon Composite. It is the same composite material they use in the Ghost X line from BBCOR and USSSA. It is terribly easy to get confused as to what bat you are really looking for. The Easton Ghost X Hyperlite only comes in a 2 5/8 drop 11. There is a Hyperlite that comes in a drop 12 and drop 10, but that is the Beast X (also from Easton) and is considerably different from the Ghost X. As well, there is a 2017 version of the Easton MAKO Hyperlite, but that is a USSSA, not a USABat, bat. Bought this (28/17) for my 9 year old in late June 2018. I thought he might have been laboring a bit since this season was his first year of travel ball and he was about 40 games into the season. He didn’t really like it. No pop. Stinging fingers. He went right back into using his 29/21 Axe Origin the remainder of the season. This bat is horrible. After a good break in period continually stings hands. Not normal stingers, drop you to your knees in pain stingers. This is compared to other -11 USA Bats. Put a 1.8 Lizard skin grip and shock knob in hopes to reduce stings- Still stings. Also- Ball goes nowhere. Mishits knucle ball off bat, float and die quickly. This means ball not getting past fielders and easy outs. You will be out at first and in pain. Not good. Tiny sweet spot on massive barrel.Bat review companies need to stop their praise of this bat just because it is a high priced Easton. Previous: Previous post: BamBooBat Review | Why Use A Bamboo Bat?